Sophia Mitchell. Date unknown. But obviously in her later years. 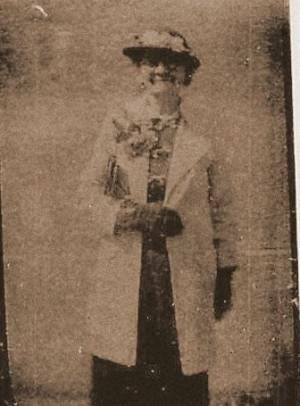 Daughter of Wiley Mitchell (1802 - 1862) & his wife Martha Patsy Wilkinson, Sophia Mitchell was born on May 21, 1834 in Franklin county, Georgia. Note: “Rolen Mitchell” was actually Roland Mitchell. 1850 United States Federal Census. Wiley Mitchell's family begins on line 4. It is important to note the minor discrepancies between Wiley Mitchell's 1850 and 1860 United States Federal Census, because the majority of discrepancies appear to be corrections. 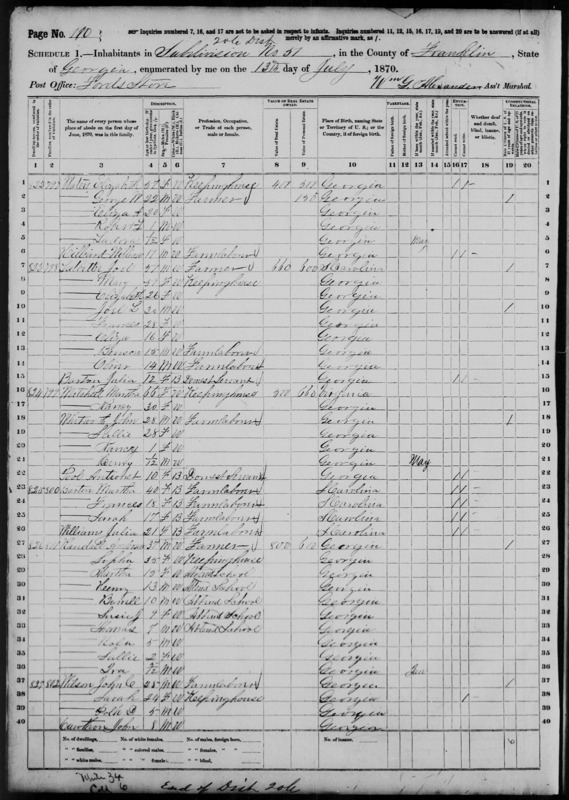 Source: “United States Census, 1860,” index, FamilySearch (https://familysearch.org/pal:/MM9.1.1/MZMB-MXH : accessed 22 January 2015), Wiley Mitchell, Sub Division, Franklin, Georgia, United States; from “1860 U.S. Federal Census - Population,” Fold3.com; citing p. 647, household ID 767, NARA microfilm publication M653, National Archives and Records Administration, Washington, D.C.; FHL microfilm 803,121. “Rolen Mitchell” is now identified as “Roland Mitchell” (which explains why Anderson Randal and Sophia Mitchell named their sixth child “Roland”). Shortly after the beginning of the “War of Northern Aggression”, Sophia's brother, Elisha (Eli) W. Mitchell (sometimes appearing as Mitchael) volunteered to serve in the Confederate 34th Infantry Regiment, Co. G. He was joined by his Brother-in-law (Sophia's husband), Anderson Smith Randal. Source Citation: Year: 1870; Census Place: District 206, Franklin, Georgia; Roll: M593_150; Page: 5B; Image: 227; Family History Library Film: 545649. 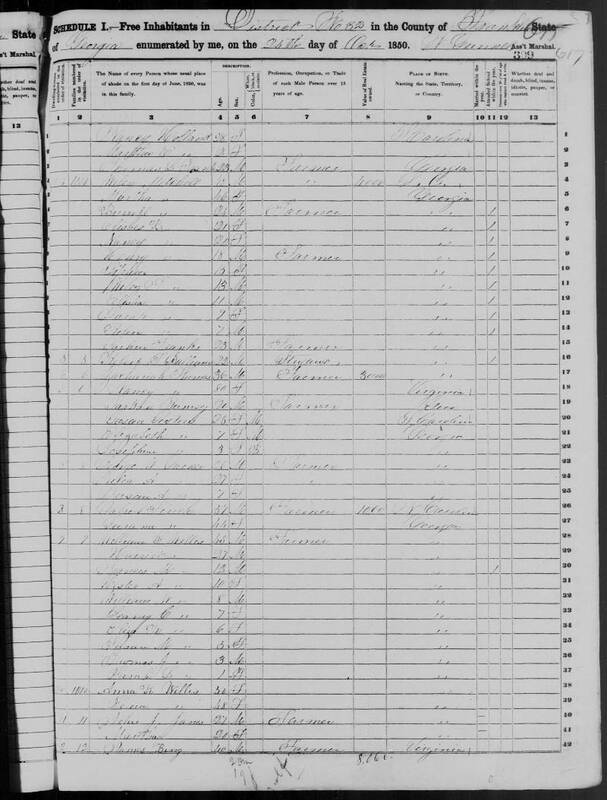 1870 United States Federal Census. Martha Mitchell (the correct age to be Sophia's mother) appears on line 16. Anderson Randal's family begins on line 27. Consistent with the 1860 United States Federal Census, Martha Mitchell reports her birthplace as Virginia. However, Nancy Mitchells age is recorded as 30 (when it should be 39). This was likely an error by the census taker. Sophia Mitchell Randal died on July 20, 1900 in Hart County, Georgia. “Pedigree Resource File,” database, FamilySearch (https://familysearch.org/ark:/61903/2:2:3SVP-7YR : accessed 2015-01-22), entry for Elisha W. /Mitchell/.